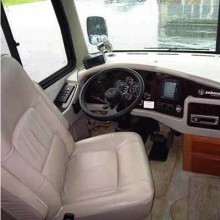 Is Driving a Class A Motorhome Intimidating? For me, not in the least. I have no fear of driving a motorhome or other big vehicle. In fact, I have driven some large and unique ones in my time – everything from specialized cargo handling equipment to semi truck and trailer. Fortunately, our 38′ Holiday Rambler Ambassador is very easy to drive and quite agile for its size. When driving a motorhome, you must be conscious of the real estate it takes to make turns, as well as its height on streets or roadways. Low hanging tree limbs, overpasses and wires can snag and damage its roof mounted accessories. And all we’ve all seen too many pictures of big rigs completely tearing off their roof when a bridge clearance is insufficient! Like any new vehicle you acquire, it takes a little bit of time and experience to get the feel of what you are driving. You must maintain a high level of situational awareness because of the size of the vehicle. Fortunately, many newer motorhomes come with expanded field of vision, courtesy of cameras which feed to a dash mounted screen. These allow you to see areas not otherwise visible from the vehicle’s windows and mirrors. The more time you spend driving a motorhome in familiar areas, the better you’ll do once you hit the road. Practice makes perfect and you more comfortable driving/towing your RV.